Alejandro Nieponice, MD, PhD visits regenerative medicine today and discusses his studies related to tissue engineering and translational medicine. 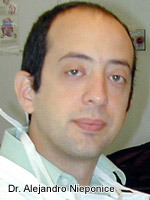 Dr. Alejandro Nieponice is currently a Research Assistant Professor of the department of surgery at University of Pittsburgh and faculty of the McGowan Institute for Regenerative Medicine. He is also a surgical associate and director of the Clinical Translation Unit at the Austral University Hospital in Buenos Aires, Argentina. Dr. Nieponice’s main goal is to foster clinical translation of novel tissue engineering approaches by bridging his surgical and research backgrounds. To accomplish that, he has promoted the creation of a Clinical Translation Unit within the operative room at the Austral University Hospital, providing full cell culture capabilities to facilitate clinical translation of cell-based technologies. Details of Dr. Nieponice’s work are available here.